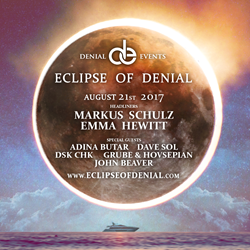 Luxury Event Provider Denial Events Announces "Eclipse of Denial" Aug 21 Aboard 100 Foot Yacht. Markus Schultz and Emma Hewitt to Headline. Denial is gearing up for their August extravaganza, “Eclipse of Denial”, which will take 80 of the most fabulous people across a prime swath of open ocean on August 21st. Departing from Charleston, South Carolina, the captain of this 100-foot luxury yacht has charted the most spectacular oceanic route to view the solar eclipse on planet earth. There has not been a full solar eclipse for 99 years, so Denial knew they had to deliver something equally breathtaking with Eclipse of Denial. Fans will witness this once in a lifetime experience while Markus Schultz provides the musical soundtrack on their collective journey. Emma Hewitt also joins the party and will fill the air with her beautiful and soaring vocals. Emma has something very special planned for the 2-minute eclipse we’ve also been told! Additional musical support on the adventure provided by Adina Butter and Grube and Hovsepian. Denial certainly has cemented their status in the highly competitive niche market of the VIP experience. They don’t claim to be for everyone, but for those who seek an elevated escape, they fit just right. Denial guests are exceptionally well-heeled and may best be described as party professionals. Jetsetters without a doubt, these Denialites as they’ve been lovingly dubbed, have traded in their mundane summers in the Hamptons for something a little more exciting and real. Much in the way a socialite perfects her charity cause, Denialites have perfected the art of the party! Do you have to be wealthy to be one? No, but doesn’t hurt either. Denial will be throwing events in Jamaica this September and Miami for both Halloween and Art Basel. The event is sold out, however a handful of VIP packages are still available starting at $1000 per person. Contact info@denialevents.com to inquire. Media requests to cover “Eclipse of Denial” can be sent to Sara Cooper PR. Christian Parth is available for interviews.